Some Boston city councilors want to lower the default speed limit from 25 miles per hour to 20. Less than two years after Boston lowered its speed limit to 25 miles an hour, some elected officials are pushing to slow down city streets even more. Citing concerns about pedestrian safety, City Councilors Frank Baker and Ed Flynn want Boston to explore a 20 miles per hour default speed limit on some or all city roads. They’ve called for a council hearing to explore the proposal, which could require a change in state law. Baker, who led a previous push for a 20 miles per hour speed limit in the city, is more open to a compromise, in which speeds on main roads would be capped at 25 miles per hour but neighborhood street limits would be lower. That would mirror a recent change in Portland, Ore., where the speed limit on residential streets — but not arterials — was dropped to 20 miles per hour. Either scenario would represent a marked slow-down on city streets, where the default speed limit was 30 miles per hour as recently as January 2017. 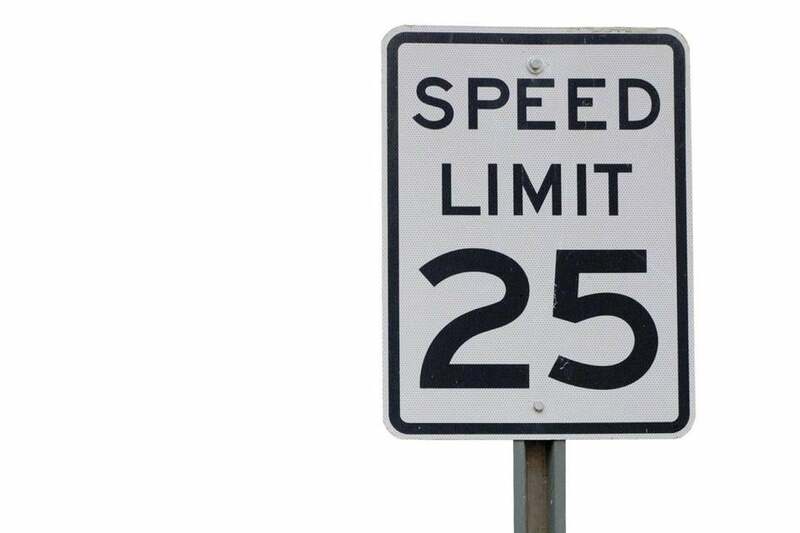 City officials pushed for decreased speed limits long before the 2017 change, but were hamstrung by state law until 2016, when lawmakers and Governor Charlie Baker gave municipalities the power to set their default speed limits at 25 miles per hour. Boston quickly implemented the new limit, as have several other towns and cities, including Cambridge, Somerville, and Revere. The law does not apply to many major, state-owned thoroughfares, such as Storrow Drive or the major interstates that zoom through the city. It also allows cities and towns to set speed limits of 20 miles per hour in designated areas — a power the state had already granted Boston. But Boston transportation officials say a lower citywide limit would require state legislation. The drop to 25 miles per hour changed driver behavior in Boston, according to a new study of the city’s speed limit change that will be presented Tuesday morning by the Insurance Institute for Highway Safety. The study of single-lane streets in Boston found that, once the 25 miles per hour limit was imposed, drivers were 8.5 percent less likely to travel above 30 mph, and about 29 percent less likely to drive over 35 mph. Previous research from AAA’s Foundation for Traffic Safety has shown that pedestrians have a much higher likelihood of surviving a vehicle strike when cars are moving slower. “We can lower those higher vehicle speeds by making this change in the speed limit, and that’s really, really important,” said David Harkey, president of the insurance institute, a Virginia-based nonprofit that researches road safety issues on behalf of the car insurance industry. Yet Harkey is not convinced that reducing the Boston speed limit even further would necessarily improve roadway safety — especially on wider, multi-lane roads where drivers may expect faster travel. Even supporters of a change to 20 miles per hour argue a speed limit change is not by itself enough to protect pedestrians. Cities and towns must also design streets to encourage slower driving, said Wendy Landman, executive director of the pedestrian advocacy group WalkBoston. “Simply changing the speed limit without doing anything about the built environment does a little, but not nearly enough,” she said. Bike lanes, raised crosswalks, streetside landscaping, and thinner travel lanes are among the traffic-calming measures that actually influence drivers to go slower, Landman said. Flynn noted that he is only pushing for a lower speed limit as one way to make neighborhood streets safer, and that he also favors design changes. Boston Transportation Commissioner Gina Fiandaca said 20 miles per hour “might not be ideal” on major roadways, especially without also making changes to street design, but added she would review any City Council proposal. But she noted that the Walsh administration — which has pledged to eliminate traffic fatalities on city streets under a program called Vision Zero — has already been lowering speed limits in certain areas under the “Neighborhood Slow Streets” system. The Slow Streets program allows groups of neighbors to lobby the city to create a safer streetscape and lower the speed limit to 20 mph. The city gives special consideration to communities with high populations of children and elderly residents. But the program has been criticized for requiring neighbors to compete for safety upgrades, rather than awarding them based on need. Stacy Thompson, director of the nonprofit Livable Streets Alliance, said the city could “implement drastically more neighborhood slow zones” in its fight against speeding. Cambridge recently required cars to slow down in major business districts, including Harvard, Central, and Kendall squares. Flynn said Boston and state officials would be invited to the City Council hearing, to explore who would be responsible for changing the limit. Baker said that even if the speed limit doesn’t change again, the proposal will at least put more focus on roadway safety. “It allows us to continue this conversation,” he said.